Dimensions of a Soccer Goal : How Tall, Wide and Big is a Soccer Goal? Whilst it is often taken for granted and very little thought is given to how wide a soccer goal is, it’s hard to think of another aspect of soccer which is more important! The entire game of soccer and the associated excitement factor is based around moments when the ball either goes into the goal or nearly goes in but doesn’t, and the question of how big a professional soccer goal becomes one of the most important aspects of the entire sport. The history of the game of soccer can be traced all the way back to medieval times in Britain when neighboring towns and villages would play against each other and the winner was the town which were able to get the ball (usually an inflated pig’s bladder but sometimes a human head!) by any means necessary between two sticks that were sometimes placed as far as a mile apart! Obviously these rudimentary origins belong to a different age entirely but I'm sure we can all think of certain soccer players who would still struggle to get the ball between posts that were a mile apart! These days there are strict guidelines about the size of the goal depending on which age group or standard of soccer match you are participating in. The width of the goal is laid down in the laws by the sport’s governing body FIFA, who also set out how tall a regulation soccer goal can be and the dimensions of soccer goal posts. The inner edges of the posts must be 24 feet (8 yards) apart, and the lower edge of the crossbar must be 8 feet above the ground. Goalposts and crossbars must be white, and made of wood, metal or other approved material. Rules regarding the shape of goalposts and crossbars are somewhat more lenient, but they must conform to a shape that does not pose a threat to players. Believe it or not crossbars were a relatively late addition to the concept and design of a goal which started out as simply two posts and it was the opinion of the referee which counted when deciding if a shot was low enough to be deemed a goal. The crossbar wasn't invented until 1875, where a string between the goalposts was used to show the height of the goal. The addition of the crossbar, which was eventually made of the same material as the rest of the goal was also useful in that it enabled a net to be attached to the back of the goal which of course is the best visual aid when deciding if a goal has been scored or not! This is why no matter which professional soccer team you go and watch, the goals always look pretty much the same. 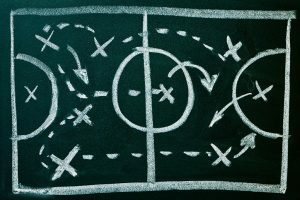 The soccer goal dimensions can sometimes have a bearing on the thinking of coaches when choosing their tactics for soccer games. For instance, a modern trend for professional soccer teams is to choose goalkeepers who are tall and have an imposing presence. In the words of many top soccer coaches they like their goalkeepers to "fill the goal" which they see as an important psychological statement to the opposing team. When you are lining up to take a penalty or another goal shot, the way the goalkeeper fills the size of the target area is vitally important to your psychological state when taking the shot. The dimensions of a professional soccer goal are 24 feet x 8 feet which means that the goalkeeper needs to be able to cover an area of 192 square feet. This shows just how difficult the job of being a goalkeeper can be and is why a number of soccer teams choose to reinforce their ability to cover the area with different soccer tactics. At defensive corners or free kicks many teams will aid their goalkeeper by placing defensive players strategically on the goal line to block the ball if it is hit at them. This can be a really effective strategy for defending such a big goal area. Whether you’re a soccer player or a fan, next time you are at a soccer game you might want to consider if your star striker should be able to shoot the ball accurately at 192 square feet of target more often!